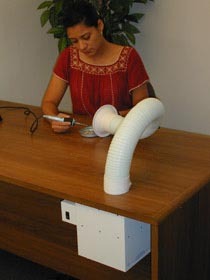 The Mounted Sentry Double fume extractor is a cost-effective choice for air purification in small work areas. This unit’s filters can be configured to address the contamination issues specific to your operation. Appropriate filter sets restrict the spread of fumes, powders and volatile organic compounds emitted by chemicals; all are typical respiratory health concerns in many industrial, medical and scientific applications. Filtration options include a variety of filter types, including HEPA filters [up to 99.97% efficient on particles 0.3 microns and larger], ASHRAE filters [up to 95% efficient on particles 0.5 microns and larger], acid gas, and activated carbon. 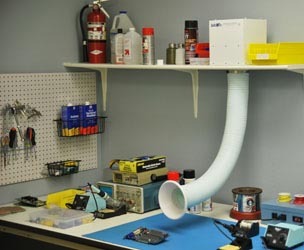 Two self-supporting flex arms and a powerful fan provide engineered airflow that can capture airborne contaminants produced at two workstations simultaneously. Each flex arm has airflow volume that ranges from 175 cubic feet per minute (CFM) (at high speed) to 25 CFM (at low speed). This unit offers traditional bench-top mounting. To keep the work space uncluttered, it can also be mounted under the bench, on a shelf, or on the wall. Larger 400-series models with 700 or 950 CFM are available.